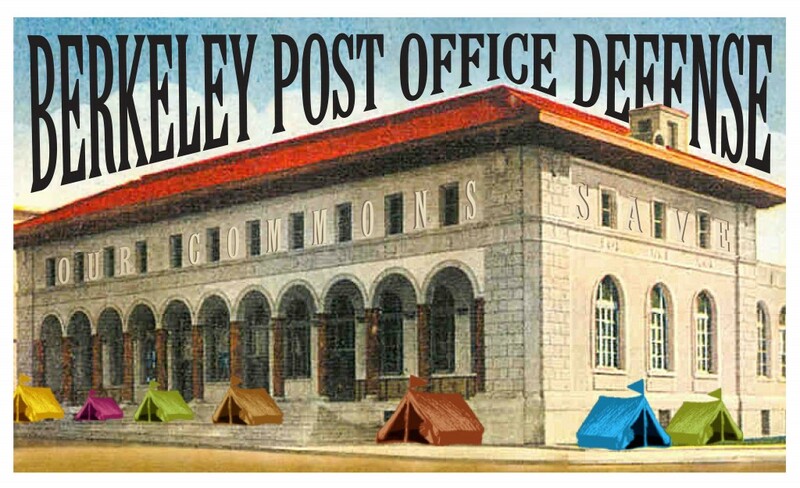 THE POSTAL SERVICE HAS THE BERKELEY POST OFFICE “UNDER CONTRACT.” !!!!!!!!!!! THE POSTAL SERVICE WANTS TO SELL THE POST OFFICE TO HUDSON-MCDONALD DEVELOPMENT GROUP. THE CITY OF BERKELEY HAS SUED THE POST OFFICE TO STOP THE SALE. A TEMPORARY RESTRAINING ORDER IS IN PLACE UNTIL DECEMBER 17th. A hearing will take place in Federal Court on December 11th. Come learn about continuing developments and help us plan our next steps in opposition to this theft of our public commons. Get an overview of the sale announcement here. Here’s a good more general overview piece. Davic Rovics gave a concert on the Post Office steps last Monday. Check out pictures and video of him playing. Also CHECK OUT OUR WEBSITE. and the Save the Berkeley Post Office website, and First they Came for the Homeless Facebook for updates. The Occupation of Wheeler Hall, and the fight against tuition increases and privatization continues. Our mission is to educate, organize and mobilize people against police and state repression. Sisters and brothers the Oscar Grant Committee invites you to join us in this vital struggle. There will be three meetings of this class, on Wednesdays at 7 pm – Dec. 3, 10, and 17. Its role in the structures of racialization in the US. Today, we live in a society in political and ethical crisis because it has instituted a revenge ethic and a desire to place people in internal exile in the place of justice and humanism. Having done so, it has created the largest prison system in the world. Each of these perspectives cries out for the abolition of prisons. The structures of racialization in the US have always depended on a prison system. The topic of the “new Jim Crow” will not only encompass a discusstion of Michelle Alexander’s book by that title, but also the accumulating material evidence that Jim Crow has become our re-institutionalized reality. 1- what is the real structure of imprisonment, and what are the ethics of each of its components? 2- what is the political structure of the prison, and how does it relate to both its structural ethics, to the ideal of human rights, and to the society that we live in. 3- what structures does the political domain us to inhale people into its prison system, to remove them from their communities and habitats, and often to punish them for their attempts to survive physically and psychically? 4- what is the nature of punishment, and why is it even a social or cultural value? 5- what is the connection between social violence, victimless crime laws, and capitalism? 6- what dimensions of the present US prison system could be abolished right now, in the interest of justice, and what does it imply about this society that it refuses to do it? 7- what is the cyclic relation between slavery, prison labor, debt servitude, the prison industry, and Jim Crow? 8- with the prison industry actually materializing a foundation for a New Jim Crow (in Michelle Alexander’s sense), what evidence do we see of the government’s actual success in re-institutionalizing Jim Crow? 9- what is the structure of “racialization” in the US, what role did the former Jim Crow play in it, and what role does the prison today play in it? If you are interested, contact me for links to some reading, or just show up on Dec. 3. Last time we read Positive Money’s proposal for an alternative banking system, parts 1-4. This week we’ll finish discussing it, with parts 5-6. The Politics of Debt Reading Group is a joint effort of the Bay Area Public School and Strike Debt Bay Area. Recent events in Ferguson have exposed shared struggles around the world, particularly in Haiti: struggles against militarization and a system of injustice. Join us as we make connections, and discuss the work we can do right here! Update, Dec. 7, 2:43 a.m. According to reports from the scene, many of the protesters have dispersed. Some have called for supporters to meet Sunday at 1 p.m. at Sproul Plaza on the UC Berkeley campus to continue their efforts. Stay tuned to #BerkeleyProtest for live updates. I’ll be gearing up & attending protest Sunday 5pm @ Telegraph & Bancroft in #Berkeley. Please attend. See you there. Will be Live Tweeting. #Berkeley — Call has gone out. Protest: Telegraph & Bancroft Sunday @ 5pm #EricGarner #ShutItDown #Ferguson #Oakland #PoliceState ALL OUT!!! Davic Rovics gave a concert on the Post Office steps recently. Check out pictures and video of him playing. This will be the second session of a class on Prisons, Prison Abolition, and the new Jim Crow. This second session of this class will address issues concerning how to approach the question and the practice of abolishing the prison system. — what aspects of the prison system can be eliminated right now, in the interest of taking steps toward instituting justice in this country? — what are the weak points in the structure of imprisonment and mass incarceration that we face, so that we can attack it there? — should we look at the police today as an extension of the prison system, or the prison system as an extension of the police, or both, and what does it mean that this question makes sense in this country today? — what relation does this police-prison nexus have toward the continual unfolding of structures of racialization today. THE POSTAL SERVICE HAD THE BERKELEY POST OFFICE “UNDER CONTRACT.” !!!!!!!!!!! THE POSTAL SERVICE WANTED TO SELL THE POST OFFICE TO HUDSON-MCDONALD DEVELOPMENT GROUP. HUDSON-MCDONALD BACKED OUT OF THE DEAL LAST WEEK. THE CITY OF BERKELEY SUED THE POST OFFICE TO STOP THE SALE. A TEMPORARY RESTRAINING ORDER WAS IN PLACE UNTIL DECEMBER 17th, BUT WAS LIFTED BY THE JUDGE WHEN HUDSON WITHDREW. There was a hearing in Federal Court on December 11th. THE POSTAL POLICE TRIED TO DISMANTLE THE OCCUPATION/VIGIL AT THE POST OFFICE LAST WEEK. BUT THEY WERE NOT SUCCESSFUL! This week we’re peeling back the mysteries of how banks work – or don’t – in the real world. Chapter 3 of Tom Sgouros’ Checking the Banks. All out to the City Council meeting Tuesday the 16th at 7pm! NOTE: the meeting is not at Old City Hall. It has been moved to Longfellow Middle School to accommodate expected large turnout. A new formation has started in the bay area….a multi racial, multi generational group of organizations, individuals and families coming together to dismantle police terror. No longer on just the defense reacting to every atrocity by the pigs. We also going on the offensive. Come to the General meetings every third Thursday at Eastside Arts Alliance to find out what we talking about and how to get down.